Reflections and Ruminations: The right spirit of Lent and its challenges. This year, the start of the season of Lent coincided in a very interesting and paradoxical way with Valentine’s Day. While the former was observed largely by the Catholic community, the latter has become a worldwide event, and has been seen as a day to show with various degrees of overture, one’s appreciation of another with demonstrations of love, often having romantic undertones. The liturgical season of Lent is often seen as a time of self-renunciation shown and demonstrated by taking on forms of mortification and discipline, so on the surface of things, many may think that nothing could be more contrasting than observing Ash Wednesday and Valentine’s day simultaneously. But in essence and in truth, it was actually quite provident that these two occasions met on the same day. There is something that the two have in common in a rather hidden way, but on different levels – and it is love. What many may find it difficult to perceive or appreciate is that underneath and undergirding the recommended observances of the traditional practices of Lent of fasting, almsgiving and prayer, is the purifying of our love – love for God and love for neighbour. A prolonged season of doing this with some level of assiduousness (40 days) is asked of all of us principally because at the core of our human and sin-prone nature, we don’t do the two very well. We often don’t love God as wholeheartedly and authentically as he ought to be loved, and neither are we as proficient in loving our neighbour as we should. So Mother Church gathers us in and helps us through a 40-day guidance of a shared experience as a community – an experience of purified love. “How does fasting purify love?” one may ask. At the heart of the issue of not loving God and insufficiently loving neighbour is an issue of self-indulgence and an inordinate emphasis on the love of self. This love of self takes on many forms, but they chiefly find their root in the sin of pride. One way of overcoming or being aware of this is to resist how we often give in very easily to our comfort needs through our unwillingness to experience being hungry. A friend once shared with me that the one thing that tells him that he is no longer poor and is comfortable in life, is when he goes to a grocery store and he has the confidence that he can buy whatever he sees, without worrying about the cost. There could be a host of factors that contributed his having this ‘marker’ in life, like perhaps having come from a materially challenged youth. I think that not only this friend of mine, but all of us too, have an inner desire to never feel a lack or a discomfort. We all like to keep hunger pangs at bay, and herein lays the rationale of fasting that a large majority of us miss. When we willingly put ourselves in a state of fasting, we are reminding ourselves that we are not ruled or controlled by our physicality. Our drives in life must not be purely instinctive and our bodies do not control us. We are taking back full control of our natures, unlike animals without consciences. Eating mindlessly all the time can make us a bit like the animals that constantly graze in fields. We do this so that we don’t feel discomfort and hungry. This has its parallels in the way we can often mindlessly take in other things in life as well – gossipy stories of others, biased opinions, trending newsfeeds and lifestyles, so much so that we end up loving ourselves and feeding ourselves in ways that leave us bloated and exhausted. If periodic physical detoxing does our bodies good, what more spiritual detoxing? Almsgiving does the same thing but on the level of money and how much it controls our lives. Always a touchy issue, we know that we cannot live without it, but that it is also something that can easily master our lives if we allow it to. Jesus himself warns us about this saying that where your treasure is, there is your heart also. Ever since money was invented, there has been a prevalence of a fear of not having enough. It has easily become a god unto its own, with a legion of worshippers at its feet. Almsgiving helps us to counter its insidious allure and power over us when we willingly give this away, controlling it rather than letting it control us. It also reminds us that our blessings are meant to be a blessing to others. Prayer is the third area of life that Mother Church wants to give us special guidance at this time of grace. She wants to remind us not only about prayer’s importance, but to draw us to the heart of prayer, which is ultimately love. If our prayer is primarily that of asking God to listen to us, our prayer becomes an extended act of loving ourselves. But if we move our motivations for prayer away from ourselves, wanting rather to love God more and purify our love for him, so too will our love for neighbour undergo purification as well. 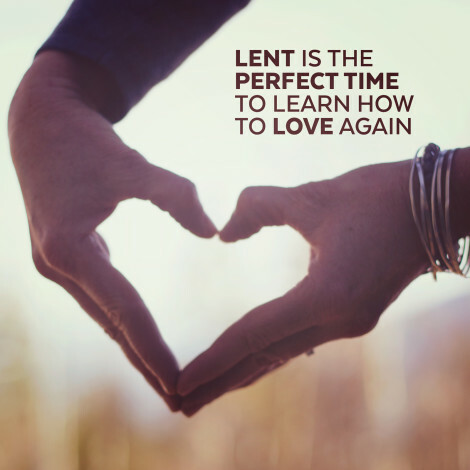 Love then is truly at the heart of all our Lenten practices. As a community, when we love God with a heart that slowly becomes more purified through mindfulness, the body of Christ takes on a form that becomes more visible and tangible in the world. Was there a clash of ideas and purposes when Valentine’s Day and Ash Wednesday met this year on February 14? I guess the answer is yes only if we have been living distorted loves in our lives.